Militants continue attacking in all the sectors of ATO area. In total, they attacked 110 times, using heavy armor: artillery, tanks, and mortars. Ukrainian Armed Forces incurred no losses in combat yesterday, but five troops sustained wounds and injuries, informed the spokesman of the Ministry of Defense of Ukraine on ATO related issues Colonel Andriy Lysenko during a press briefing at Ukraine Crisis Media Center. In the Donetsk sector the situation at the Svitlodrsk bulge escalated again. In total, combat activity in the vicinity of Luhanske continued over five hours, during which militants conducted massive artillery, tank and mortar attacks and also actively opened fire from small arms. “Militants deployed mortars and armor in the sunset, and shot from tank 16 times after 11 a.m. They conducted artillery and mortar attacks after the sunset, followed by another tank shelling of ATO troops’ positions,” reported Col. Lysenko. Combat activity around temporarily occupied Horlivka still continues, especially in its northern outskirts. Militants were using heavy armor in this frontline area only during the hours of darkness, conducting provocations involving the use of small arms during the day instead. “Russian occupational troops launched about 75 mortar shells at our positions in the north of Horlivka perimeter within 24 hours. Moreover, a firefight continued over an hour in Novhorodske in the afternoon. It involved the use of small arms and grenade launchers. The armistice held in Verkhniotoretske, in contrast to the previous days,” said the spokesman. Extremely intense hostilities continue in Avdiivka and its flanks, in Kamianka and Butovka coal mine position. Militant were actively using tanks in this area yesterday, launching over 40 projectiles. The number of mortar shells launched by insurgents in this area exceeded 170. Shooting attacks lasted non-stop here, which resulted in Avdiivka being cut off electricity supply due to power line breach. “Electrician crews are waiting for the shooting attacks to stop and are ready to start repairing the power supply line. At present, all vital infrastructure of the town has been connected to electricity generators. There is certain water supply reserve which was made after filtration plant had resumed operation,” explained Col. Lysenko. Militants were active in Pisky near the Donetsk airport, shelling Ukrainian positions three times. Two attacks involved the use of tanks. Militant sniper’s activity was recorded in the adjacent Nevelske. Russian proxies conducted sporadic mortar attacks in the same area in the dark. “In total, 46 hostile attacks took place in the Donetsk sector yesterday, and 31 of them involved the use of heavy armor,” informed the spokesman. In the Mariupol sector one firefight involving the use of armor and grenade launchers took place in the Mariinka district in the evening. The armistice absolutely held in the outskirts of Dokuchaevsk and further southward along the frontline to Chermalyk. “On the opposite, the situation in the frontline area from Pavlopil to Shyrokyne remains unchanged. Firefights continue all day long there,” added Col. Lysenko. 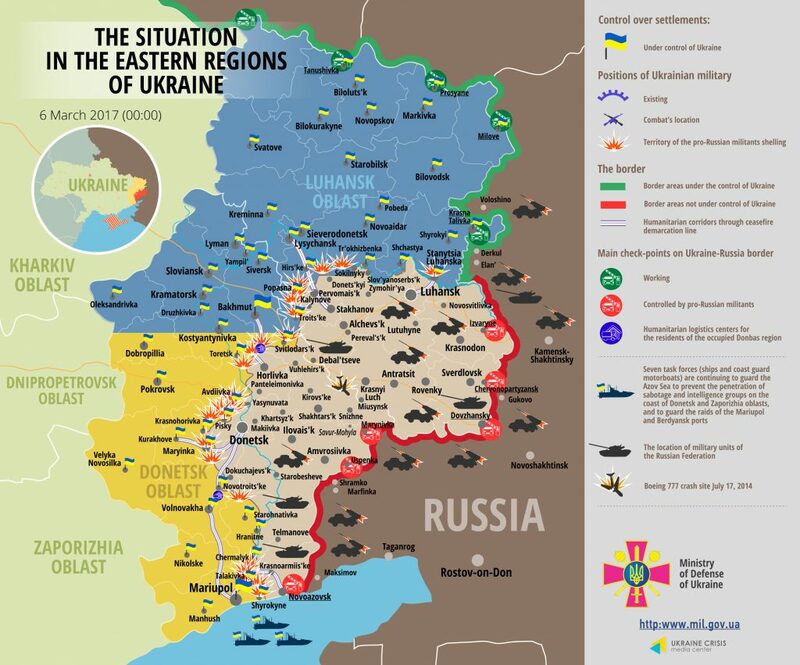 The area on the eastern approaches to Mariupol remains the most difficult one. Militants were shooting from tanks in Vodiane and Shyrokyne in the morning. Russian proxies conducted mortar attacks there and in Hnutove yesterday. They actively used armor, light weapons and sniping rifles. In total, militants attacked 43 times in the Mariupol sector, using heavy armor 13 times. In the Luhansk sector 10 ceasefire violations took place yesterday, and half of them were in the Popasna district. Militants started shooting from mortar launchers at northeastern outskirts of Popasna after 1 a.m. They also shelled Ukrainian positions in Novooleksandrivka, launching up to 10 mortar shells. Ukrainian strongholds in Troitske came under fire in the morning. Russia-backed militant groups used mortar launchers, APC weapons and small arms there. “The enemy violated the ceasefire in Popasna district yet another time, performing two brief armed provocations. Late at night militants tried to provoke our defenders in Novotoshkivske at the Bakhmut road, opening fire from anti-tank grenade launchers. Ukrainian troops did not return fire. Following this, the armistice held in this frontline area,” said the spokesman. Militants violated the ceasefire once in Novyi Aidar district, launching 15 mortar shells at Ukrainian positions in Krymske. Moreover, insurgents opened fire from small arms twice during the day in Stanytsia Luhanska. Report on the military developments as of March 5 is available here. Interactive data on the shelling: chronology shelling chart and the interactive map.